While updating my Petya/Notpetya notes, I saw that ClamAV now detects resources 1 and 2 (zlib compressed PE files) as Mimikatz. 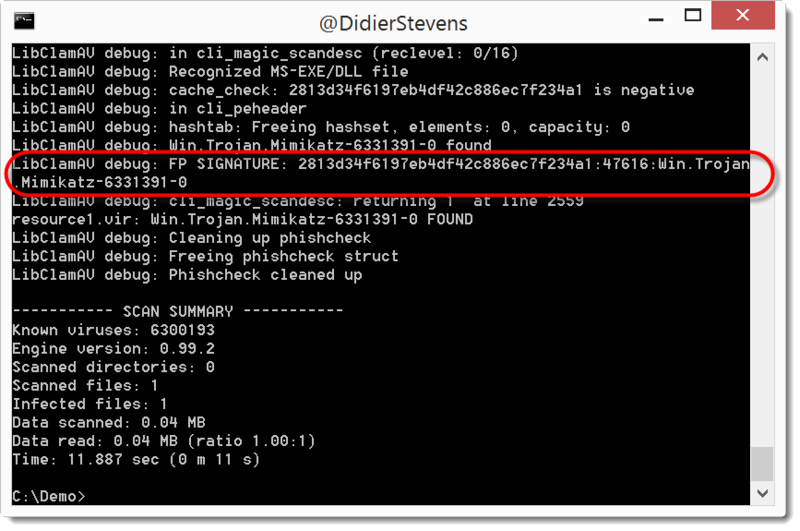 Curious about how they detect Mimikatz, I wanted to take a look at the signature. I’ve done this before, but I forgot exactly how. So here is a blog post to remind me next time. I hoped for something more interesting: this is an MD5 hash-based signature. 2813d34f6197eb4df42c886ec7f234a1 is the MD5 hash of the file, 47616 is its file size, and Win.Trojan.Mimikatz-6331391-0 is the signature name.